In the 7th, and final, round of the 2014 NFL Draft, the St. Louis Rams used the 249th overall pick to select University of Missouri defensive end Michael Sam. Sam, who was named the 2013 SEC Defensive Player of the year, publicly came out as gay after the end of his senior season at Missouri. After he was drafted, cameras showed his tearful reaction upon getting the news that his dream of playing in the NFL was coming true. Sam broke down crying tears of joy before embracing and kissing his boyfriend. The reaction was played over and over and over again in the days that followed. The media was all over the news of the first openly gay player to be drafted into the NFL, and it’s pretty safe to say that just about everyone knew that they would be, for better or for worse. Sam himself expressed that he wanted to be judged on football and not his personal life. Many people are focusing on Sam being gay. Truthfully, the publicity that comes along with drafting the first openly gay player in NFL history is not something that appealed to many teams and can be seen as a distraction. That’s not to say that it will be, but realistically speaking, that is something that teams more than likely took into consideration. However, there are other factors that are not helping Sam’s chances. Although the aforementioned publicity is a factor, the fact that he is gay doesn’t have anything to do with what he does on the football field. One thing that seems to get lost in the proverbial shuffle for some people is that, although he was the SEC Co-Defensive player of the year last season at Missouri, there are players that are simply better than he is. Not to mention, the Rams are very deep when it comes to their defensive line. The other thing that is not helping Sam is his, at best, mediocre scouting combine results prior to the draft. Sam ran the 40 yard dash in a pedestrian time of 4.91 seconds, had a 25.5 inch vertical jump and only managed 17 reps (of 225 pounds) in the bench press. While numbers don’t necessarily matter in football as much as they do in a sport like baseball, these numbers matter a great deal to teams and scouts alike. One of the things that can help Sam the most is the intangibles, or the will to win, desire and heart that a player has. They always say that “you can’t measure the intangibles”, and they’re right (just ask Tom Brady), so he is certainly capable of making the team. 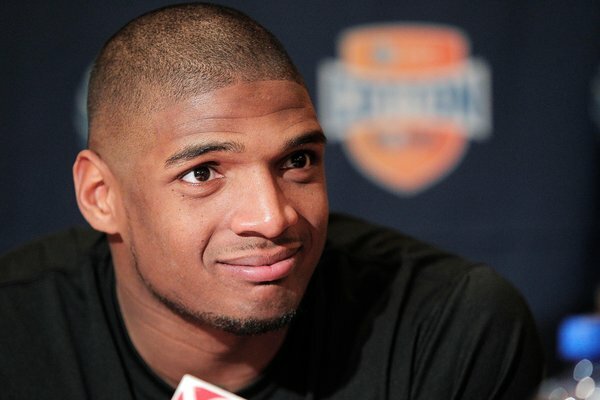 It’s still unknown whether or not Michael Sam will make the Rams. If he makes the team, that’s awesome for him. It’s great to see someone achieve their goal of getting to the highest level of their profession. In the event that he does not make the team, it is not because of his personal life, it’s because he is not as good as the other defensive linemen. That’s what’s more important when it comes to Michael Sam making the Rams’ roster this season.